EVENT DATE: Saturday, December 13, 11:00 a.m.-3:00 p.m. The Westside Repair Café is open to Our Time Bank members and the general public! 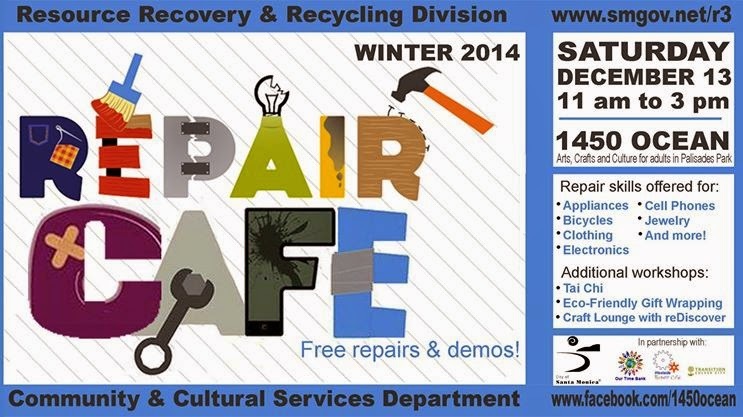 Hosted by the City of Santa Monica Resource Recovery & Recycling Division, several stations will be in operation, including: Wardrobe/Sewing, Computer Repair, Appliance Repair, Jewelry Repair, Bicycle Station, Free Craft Table, and a Giveaway Table. Not all projects can be accommodated: e-mail ourtimebank@gmail.com in advance with a list of items you’d like repaired. Please include brand and model numbers where possible.